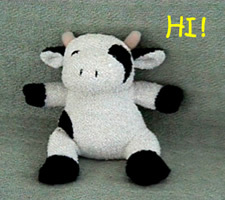 This is Wohl, my "TopCow" cow. I freed Wohl from his imprisonment at Paramount's Kings Island Amusement Park in Ohio. He was named after David Wohl, writer & co-creator of the Top Cow comic, Witchblade. Random Quote: "Wherever you go, there you are."